Starting a new hobby is always exciting. If you’re new to meditation you probably feel the same way. You’ll want to get as much information as possible on the subject. From researching online to watching YouTube videos, there are many ways to learn about your new journey to leading a stress free and happier life. Traditional sources for instance books, while often overlooked can actually provide you with invaluable insight about any topic. However there’s a lot of information overload out there that’ll make meditation seem like an elusive concept which is difficult to master. So we want to make it easier for you. With so many books at your disposal, how will you know which is the best meditation books for beginners? In case you’re unsure, we put together a list of the best meditation books for beginners on the market. Hopefully they’ll provide you with the necessary foundation & motivation to kick start your meditation experience. There are different forms of meditation from mindfulness meditation, Buddhist, Taoist to Christian. Before selecting a book, determine if it’s in line with the exact meditation style you want to do. Some meditation books have religious undertones and vocabulary that may not match your beliefs. Opt for a book that you can relate to regardless of your spirituality. Trendy buzzwords and fancy words may be what sell books these days. But here’s what’s important: How easy is it to read? 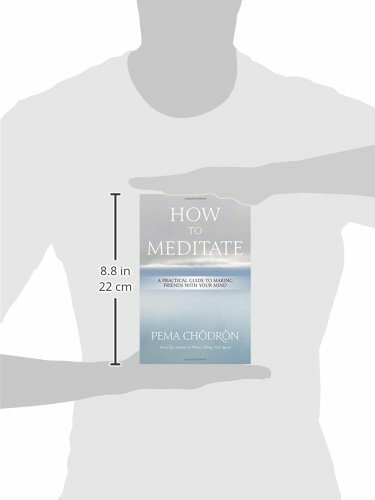 The ideal meditation book should be simple to understand. Look for a book that cuts down on complex jargon but rather offers practical explanations on mediation. This way you can easily implement the information in your everyday meditation sessions. Meditation doesn’t have to seem like a chore; if anything it must provide for one of the most relaxing and calming experiences of your day. Some books will make you want to give up before you even start because of the complex set of instructions they expect you to follow. Now let’s look at a few you should consider. Want to learn how to reconnect with peace and tranquility in the midst of your busy day-to-day life? This book will teach you how to release tension and relieve stress. It’ll provide you with friendly advice that’ll fit easily into your tight schedule. This book will make it easy for you to learn meditation by providing you with step by step instructions for 18 meditation techniques that you can practice anytime, anywhere. You’ll get 14 meditation techniques to promote mindfulness when you’re in everyday stressful situations like traffic jams and work presentations. It provides you with essential advice and guidelines for overcoming obstacles like boredom and relating skillfully to your thoughts and emotions. It’ll provide you with three 28-day meditation plans for those months you need extra emotional support, happiness or relaxation. Need occasional meditation quotes to lift up your spirits? This book will provide inspirational quotes and practical tips that’ll motivate you to deepen your meditation practice. Most meditation books aren’t easy to read but that’s not the case with this book. It gives you clear instructions to take up your meditation session. With the increased day to day pressures of the modern world, finding time for yourself isn’t easy let alone squeezing in time to meditate. This book might provide a solution to that problem. You’re given the tools needed to learn to meditate in a time frame that even the busiest people can handle: Just 8 minutes a day. This 8-minute meditation program is one of the bestselling mindfulness programs in history. Meditation isn’t really complicated as most books make it out to be by including dozens of rules to follow. So make sure the book you pick has simple processes that you can follow. The book includes clear and supportive step by step instructions and FAQs to aid in your meditation session. 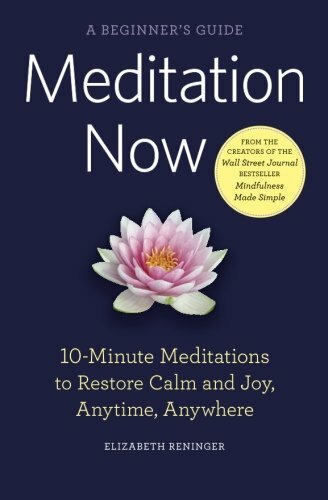 Whether you have 10 years or zero meditation experience you’ll find this book handy. Also, even if you have only 20 minutes free time daily to engage in a meditation session this book is useful. If you’re a beginner you can start meditating today thanks to the 22-day course. This course will help you reduce stress immediately as your mind begins to calm down. You can learn meditation quickly because of the easy terms it uses. If you don’t like the mantras and superstition characteristics found in most meditation books, you might like this book which gets straight to the point. 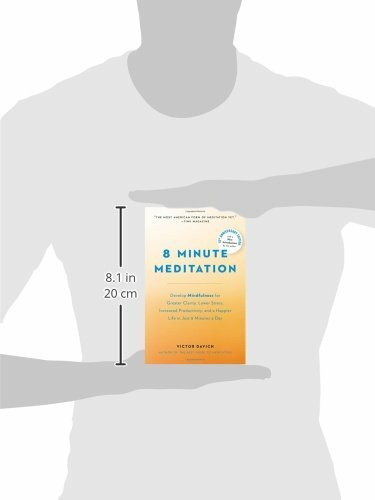 This super-easy and fun meditation book allows you to learn about meditation and get started quickly. This book is so easy to understand after reading it you can literally start meditating anywhere whether you’re at work or on vacation. This book has a refreshing religion free approach to meditation so you won’t come across chants which are not in line with your belief systems. No matter your beliefs you can still read it because it doesn’t teach religion; rather it teaches the simple art of meditation. This meditation book has been named one of Library Journal’s Best Books of 2013. The author is a revered Buddhist teacher but regardless of your religious beliefs you can still easily read and understand it. She possesses a wealth of knowledge on the subject and is well known for her unique ability to teach about peace and meditation to any reader. It has a great compilation of meditation instructions that the author has used on her students for years. With this book you’ll learn about different meditation techniques for instance how to prepare for meditation and making the commitment. The book teaches you how to stabilize your mind and cultivate the right attitude among other topics. You’ll get insight on how to manage your feelings so as to ultimately have healthy and well-balanced emotions. This is one of the most loved Zen meditation books for beginners. It gets right to the point by giving you insightful information on meditation just by simply reading the first page. If you’re into modern spiritual classics, you might like this particular book. 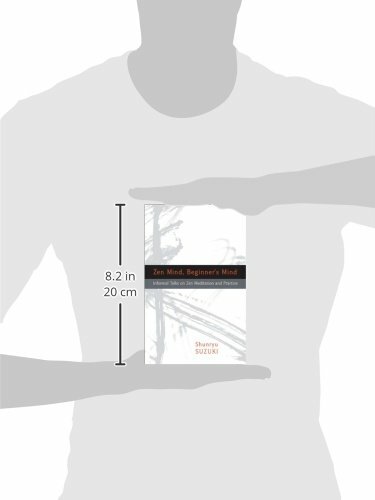 Readers have recommended it as the best first book to read on Zen meditation. You’ll start off by learning the basic postures to engage in for effective meditation. The book also gives you insight on breathing techniques and it teaches you in a way that’s very clear to comprehend. Best of all it’s written in a clear but interesting manner so you’ll remain captivated from the first to the last page. This book is well known for its simplicity in explaining all you need to know about meditation. It’s rated one of the top five Buddhist books and known for providing one of the best introductions ever with regards to meditation. The author of the book was one of the most influential spiritual teachers of the twentieth century and is also known as the truly founding father of Zen in America. Now that you have a general idea of some of the best meditation books for beginners, which one will suit you best? Select a book that’ll motivate you to start meditating right away. A book with complex words and difficult to follow instructions might discourage you from pursuing your new hobby. 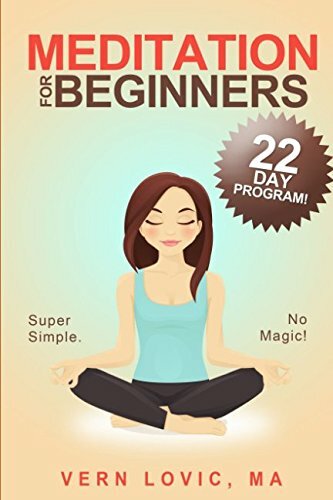 For a beginner you might like the Meditation for Beginners: A 22 Day How to Meditate Course by Vern Lovic. We like that this book has a refreshing religion free approach to the subject of meditation. As a result regardless of your religious affiliations you can learn about meditation easily. To many, meditation is a simple concept which relaxes you to ensure a general stress free mind and overall well-being. And you can get that with this book. It’s written in such a way that will be useful whether you’re a newbie to the meditation practice or have experience in the area. You won’t be dissuaded by any unfamiliar chanting or mantras that you might not understand. Rather you’ll get a fun and easy to read book that will make you want to start with your meditation experience right away. After all that is the whole point right? So choose a book and start your journey to creating a healthy and well balanced mind.